After all that time in South Dakota, it was really another move & it’s amazing how much work there was to do, here, at my sadly neglected house. But there’s nothing like home – and on the plus side? I already have plenty of cobwebs for Halloween! In the fall, nothing says “home” to me more than the smell of Pumpkin Bread, Pumpkin Cake or Pumpkin Cookies in the oven. Pumpkin anything, really. I chose to make this Pumpkin Bundt Cake with Maple Bourbon Brown-Butter Glaze for my first post back, and this one is a winner for sure. And speaking of home, did you know the Bundt pan was developed in the Twin Cities? “You betcha” it was. I only very slightly adapted this recipe from the New York Times. It’s one stunner of a cake with just a mild spicing. To tell the truth, I was a bit skeptical of the amount of cardamom in the cake, but the flavors couldn’t have been better and it is such a nice little change from the ubiquitous Pumpkin Spice flavor. NYT claims the cake is better on the second day; I can’t say because I made it the first day and glazed it on the second, so I didn’t try it on the first. Hope you’re proud of me for not digging right in before it was frosted, lol! I was glad I waited because that glaze is absolutely to die for. It really “makes” the cake. Who knew that 2 tablespoons of browned butter could add such depth. I did have trouble with the consistency of the glaze. My solution? A touch of bourbon to play off the other flavors. So first the glaze was too thick, then too thin. My suggestion: turn over a small bowl and do a test with the drizzle. Scrape it off and return it to the glaze when you have it just right. Only then, glaze the cake. Heat oven to 350 degrees F, and butter and flour a 12-cup (or larger) capacity bundt pan. In the bowl of a stand mixer fitted with the paddle attachment, combine brown sugar, butter and olive oil. Beat on medium-high until light and fluffy, about 3 minutes. Add the eggs one at a time, mixing for about 20 seconds in between each egg. Add the pumpkin purée and yogurt, and mix until well combined, scraping the bottom and sides of the bowl as necessary. Transfer butter and all the brown bits from the pan to a heat-safe bowl, and let it cool slightly. Whisk in the confectioners’ sugar, maple syrup, a tablespoon of bourbon and salt until smooth. The glaze should be thick but pourable. If it’s too thin, add a bit more confectioners’ sugar. If it’s too thick, add a little more bourbon. Transfer the cake to a serving platter and pour the glaze evenly over the top. Sprinkle with pecans. Let the glaze set for a few minutes before slicing. I’m sharing this recipe out at Fiesta Friday, hosted this week by Petra @ Food Eat Love and Vanitha @ Curry and Vanilla. Stop by Fiesta Friday and explore. Hint: I’m seeing some Halloween posts and Holiday baking!! This entry was posted in Click here for Fabulous Food Posts and tagged Alcohol, bourbon, brown butter, bundt cake, Cake, Desserts, glaze, Maple Syrup, new york times, Nuts and Seeds, Pecans, Pumpkin, Yogurt. Bookmark the permalink. I recently baked The First Pumpking Cake in mu life 🙂 It was… interesting 🙂 And I am so sorry I did not noticed you recipe first. It look very delicious ( and different as I made). Perfect cake for this season! Glad you made it home Mollie– cobwebs and all!! I don’t know about you, but when I’ve been away, I love settling back in at my own little home. And– this cake is a stunner! I want to try the different spice blend. I kind of OD on pumpkin pie spice this time of year! The glaze looks positively luscious! Hope all’s well at the homestead. hugs hugs! Wow, those photos…I’m drooling. Sounds like perfection! Thanks so much! It’s one gorgeous cake. 🙂 A bundt pan makes any cake seem super special. Well now, this looks good. Love that the bourbon fixed your problem. My Mom used to say “There’s no problem that alcohol won’t make worse.” Which was very wise. But then she didn’t know about this glaze, lol!! Oh, that’s a cake I couldn’t withstand …. Thanks Cecilla – I couldn’t, either. I had some for breakfast the next day! Oh yummy! Your cake looks and sounds absolutely delicious. Is there a way for you to send me a slice, lol! An amazing cake, and I love your addition of bourbon to the glaze. Great tips on checking the glaze consistency before adding it to the cake. lol! I’d like to send you about half of it! I had hoped to share it with the neighbors, but it seems they’re watching their calories! 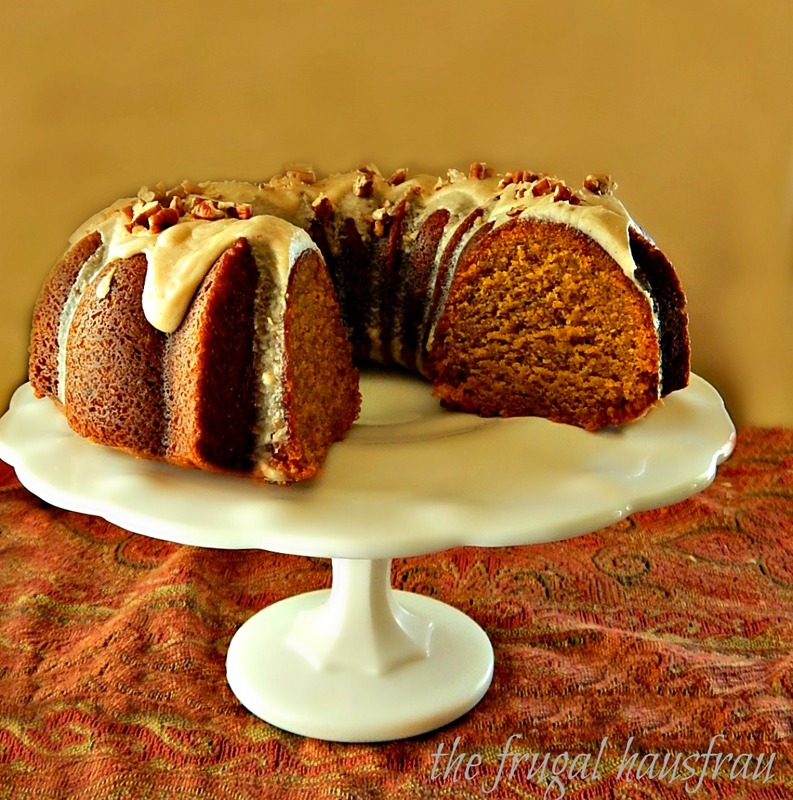 Wonderful bundt cake, my grandma made it really similarly and I love the addition of bourbon! Thanks, Chef! A little bourbon goes a long way! 🙂 I don’t drink bourbon or whiskey but am using my bottle tablespoon by tablespoon, lol! Oh my gosh, welcome home Mollie! I know that must be such a relief to get them all settled and to be back in your own house with the gang. The cake looks fab, of course! Thanks! That cake is just to die for. 🙂 Chance is having a blast and of course has his big old nose in every box, bin and drawer I’m sorting. I’m still not really “puppy proofed” here so it’s a bit of a mess. Homer hasn’t missed a beat and is right back in her favorite places. Thanks much, it really was! You wouldn’t believe how many cake recipes I try that don’t really turn out well but this one is absolutely perfect. Love the sound of this, so seasonal. Home at last! This cake looks so good. Cardamom isn’t a spice I use often but now you have me curious. Yum! This is right up my street omg. Maple flavoured anything!! !